Fans of The Love Boat TV show from the late 1970s beware. The author of this review is completely unfamiliar with the series and thus is unqualified to say whether the slot machine bearing the same title is in any way loyal to the feel of the source material for the game. Disclaimer out of the way, let’s look at Playtech’s homage to the piece of classic television from the most objective of standpoints. The game itself is played across five reels and three rows. 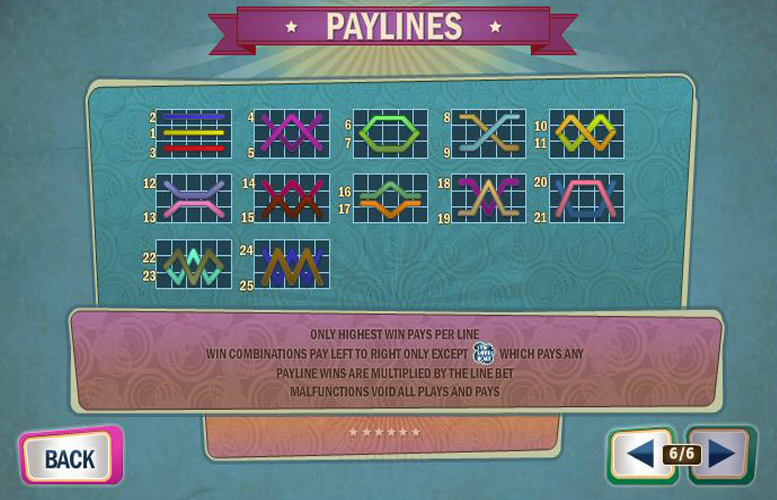 There’s 25 fixed win lines and a maximum main game jackpot of 3,000x the line bet. There are some great side games that players can unlock. These have clearly been inspired by the TV show, although the specific references are lost on me. 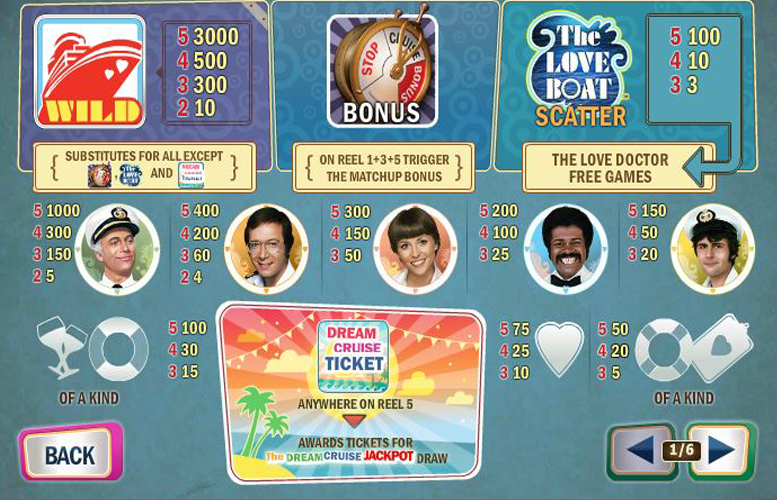 Even without knowing a thing about the original content, The Love Boat slot machine is an enjoyable, modern title with a lot to offer the casual and seasoned gamer alike. Great game features. Several different bonus stages keep the action varied. Potential for a massive jackpot win off any sized spin. Not suitable for the very highest rollers around. When some machines offer £2,000-£2,500 per spin, the £625 of The Love Boat seems a little small. Very low return-to-player rating. Being just below 92% makes this game one of the least fair we’ve played for a long time. Ship “wild” = 3,000x the line bet. Captain Merrill Stubing = 1,000x the line bet. Dr Adam Bricker = 400x the line bet. Vicky Stubing = 300x the line bet. Bartender Isaac Washington = 200x the line bet. Gopher Smith = 150x the line bet. One of the areas in which The Love Boat shines is with its bonus features. It offers several, as well as a special £10,000 jackpot game. Landing three ship’s telegraph “bonus” symbols anywhere on reels one, three, and five simultaneously will trigger the Matchup Bonus. 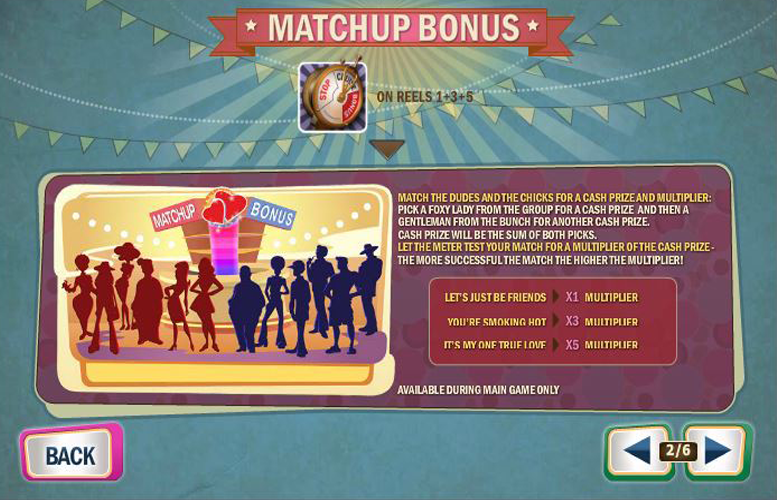 During this side game, players must match the “dudes and the chicks” for a cash prize and multipliers. They first pick a female from the group on the right for a cash prize, and then a man from the group on the left for another. The total prize pre-multiplier will be the sum of both picks. “Let’s just be friends” = 1x multiplier. “You’re smoking hot” = 3x multiplier. “It’s my one true love” = 5x multiplier. Note: This bonus feature is available during the main game only. Landing three or more of The Love Boat “scatter” symbols anywhere on the reels will trigger The Love Doctor Free Games. During the free spins, landing the Doctor symbol on the reels causes the “love meter” at the right-hand side of the reels to increase. The higher it reaches, the more features are unlocked. These prizes can include freezing wilds, more free spins, and additional multipliers. 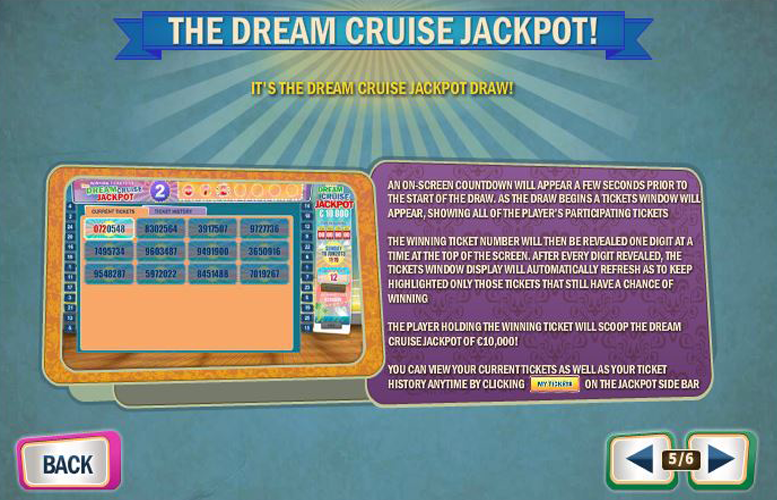 Players can win tickets to a recurring jackpot draw when playing The Love Boat slot machine. Landing the “Dream Cruise Ticket” symbol anywhere on reel five will award a random amount of tickets to the draw. A jackpot total is shown on the side bar at the right of the main game screen. An onscreen countdown will appear a few seconds prior to the start of the draw. As the draw begins a ticket window will appear. This shows all the player’s participating tickets. The winning number is revealed one digit at a time at the top of the screen. The player who holds the winning ticket will be awarded with a total of £10,000. During the game, it’s possible to view current tickets as well as a history of tickets awarded by clicking on “My Tickets” on the jackpot side bar. Glasses, or life ring = 100x the line bet. Heart = 75x the line bet. Smaller life ring or clip board = 50x the line bet. 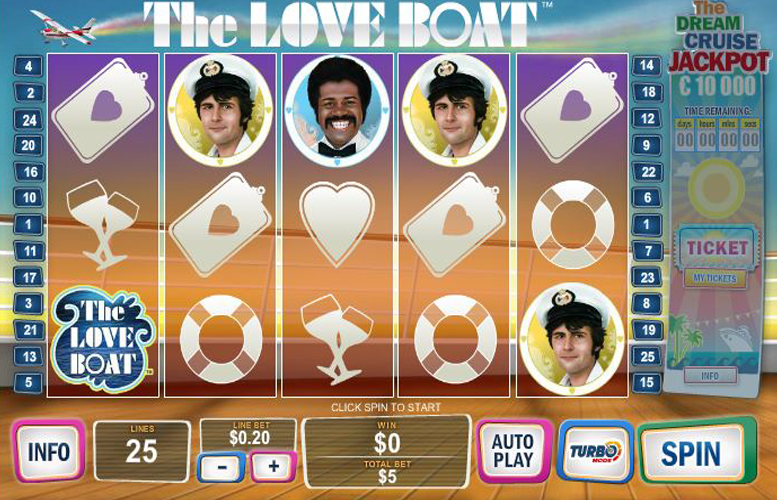 Players have only one option to adjust the size of their bet on The Love Boat slot machine. They can either raise or lower the line bet and that is all. This is because the number of lines remains fixed at 25. Therefore, the minimum possible bet is 1p across all lines. This equals a total of 25p. Meanwhile, a bet of £25, makes the cost per spin a more sizeable £625. Despite having little to no idea what The Love Boat was before playing the machine, it was rather enjoyable. It’s a modern looking game with a great array of features and side games to play. Each of these can be lucrative but pale in comparison to the Dream Cruise Jackpot. That alone makes this title worthy of playing, even if all the references are before your time. Players should beware however; the slot is particularly stingy when it comes to its return-to-player rating. It offers a paltry 91.98%, which is the lowest we’ve seen for a long time.